Flexibility is vital in the broadcasting business. 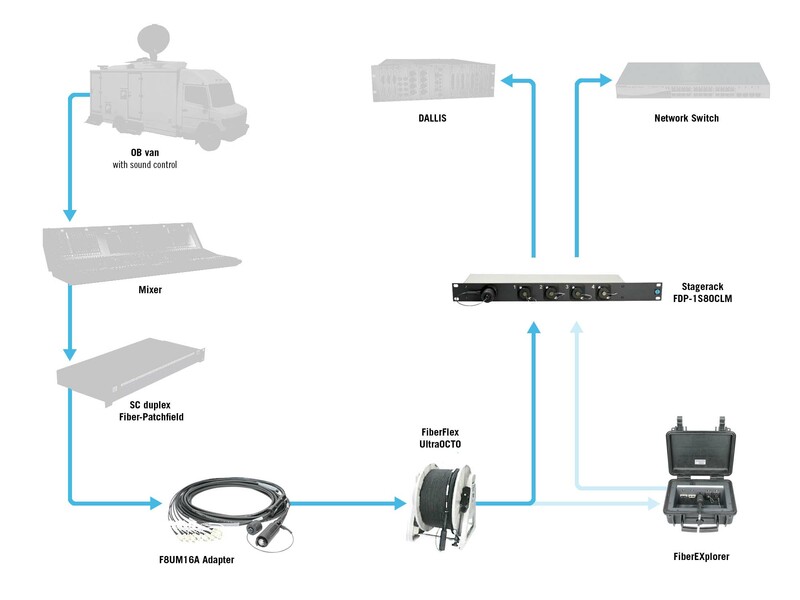 Major broadcasting companies such as Germany’s SWR help to achieve this by using our SmartBeam OCTO System in two of their mobile HD outside broadcast units. Quick, simple fibre-optic connection of DALLIS audio interfaces with the LAWO mixers in the broadcast unit? Extra image transmission line between the unit and the recording location, including intercom? No problem! With FiberFlex cable, comprising 8 multimode fibres, and a hermaphrodite 8x expanded beam connector, SmartBeam OCTO has plenty of reserve to cope with even the most challenging tasks. Even in the worst weather, our SmartBeam OCTO comes up trumps as a genuine HEC – harsh environment connector. It’s simple to clean on location, using only a clean cloth and clear water. Many audio mixing desks operate on the MADI (Multi Channel Audio Digital Interface) transmission protocol. Fibre-optic links use multimode fibres with SC (subscriber connector) connectors. To create a solution that could handle the rigours of touring, bulkhead adapters were used to adapt the optical fibres to SmartBeam DUO Expanded connectors, extending transmission to distances of up to 2000 m.
The setup shown in our application example uses fibre-optic cables to link a Soundcraft Vi stage box and Soundcraft Vi3000. This will also work with other mixers and gear, provided they have optical MADI inputs and outputs – including SSL, LAWO, Salzbrenner Stagetec, RME, DiGiGrid and DirectOut. 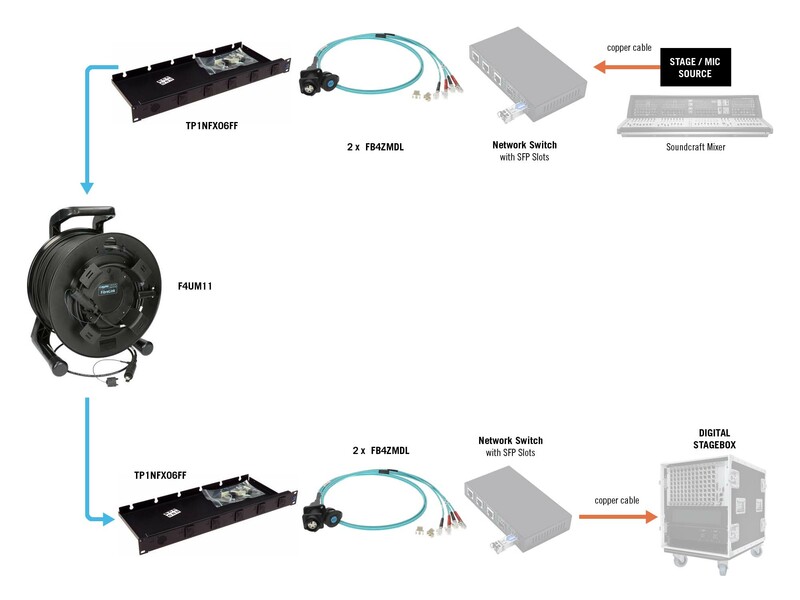 This setup offers a fast and reliable connection method. In fibre-optic transmission the transmitter and receiver are galvanically isolated, making ground loops a thing of the past. Digital mixing desks by Behringer/Midas are extremely popular with equipment rental and touring companies. 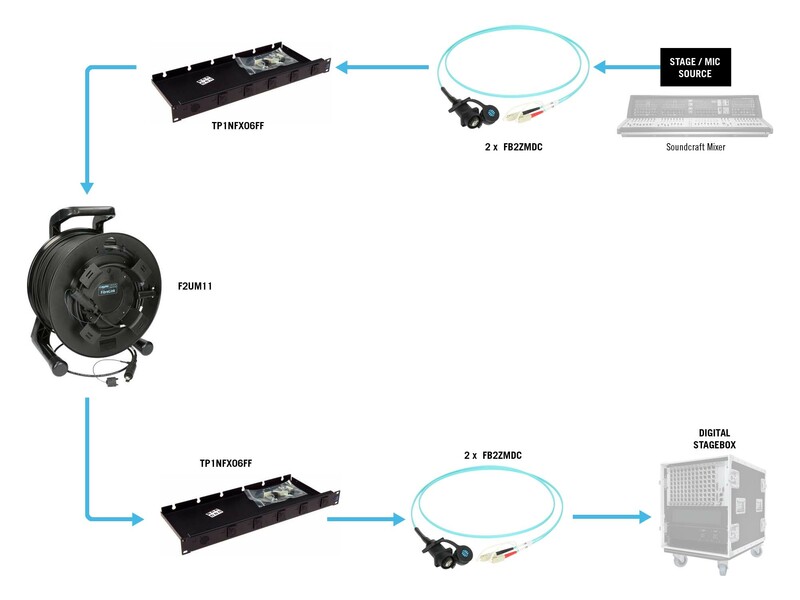 However, copper cable connections between digital stage boxes and mixers are not equal to the demands of every situation; the AES50 protocol (also known as SuperMAC or HyperMAC) is limited to distances of 100 m when copper cable is used. But there’s a solution. 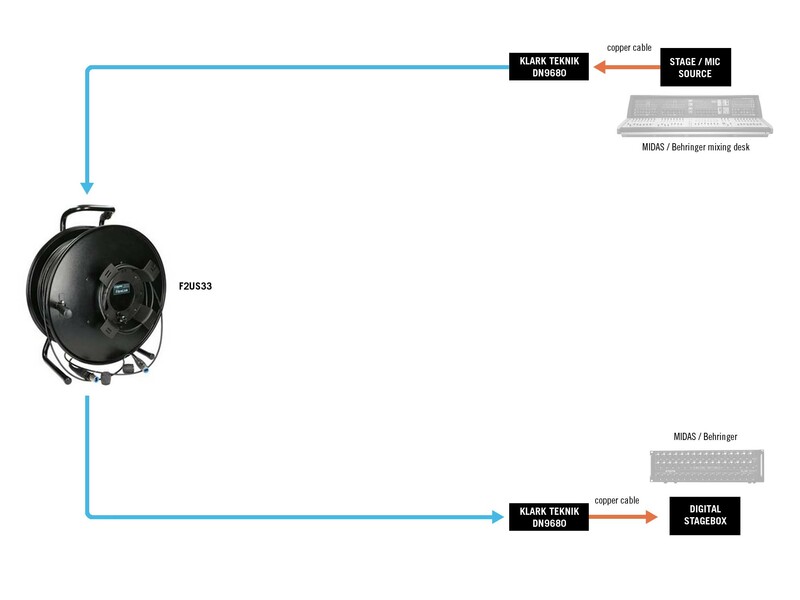 Using the KLARK TEKNIK DN9680 AES50 Extender and our FiberLink cables, this distance can be extended to up to 1000 m. The 19” device has Neutrik opticalCON connectors as standard, and can therefore be used with our F2US33… cables; alternatively, the opticalCON connectors can be adapted to SmartBeam (F2US11…) with an FB2ZSDL… Bulkhead Adapter. In both cases, note that the DN9680 has a single-mode laser and must be used with single-mode cables. In addition to MADI, a further transmission protocol widely used in live audio is the Dante (Digital Audio Network Through Ethernet) protocol by Australian company Audinate. As a Layer 3 protocol, this largely uses standard network components. 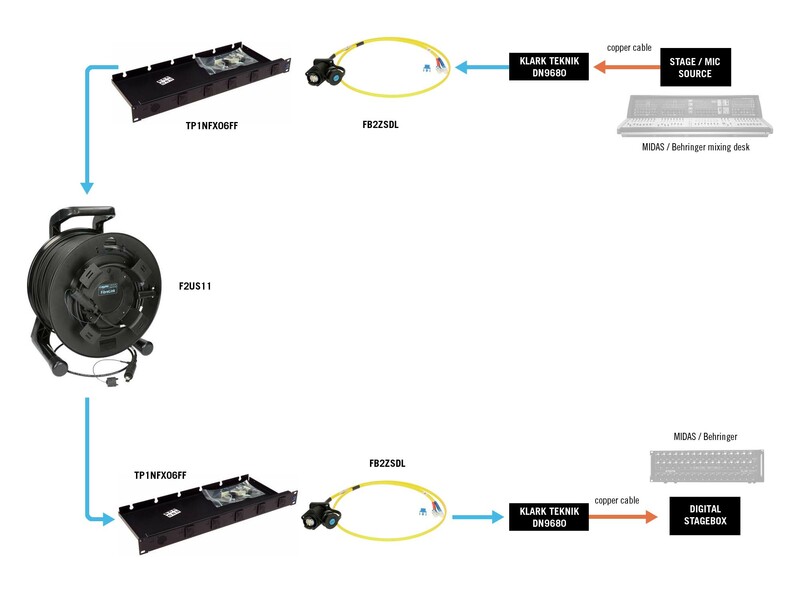 Because of this, conversion from copper to fibre-optic transmission is simple using appropriate network gigabit switches and matching SFP (small form-factor pluggable, or mini-GBIC) transceivers. The setup shown in the application example here uses Dante to connect a Soundcraft console with appropriate interface to the corresponding stage rack, which also has a Dante interface. Given suitable hardware, other component brands can be integrated into the Dante network.